Whether you are missing a single tooth or multiple teeth, you want a dental solution that will restore your smile as close to your natural teeth as possible. With dental implants, patients can replace missing teeth with permanent implants that look, feel and perform just like natural teeth. No one but you and your dentist will have to know that you received implants, but you'll reap the benefits of a beautiful, natural smile. It's easy to see why implants are becoming the number one option for replacing missing teeth. 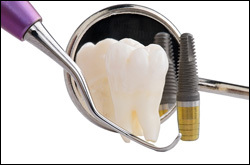 Dental implants are artificial tooth roots used to replace a single tooth or multiple teeth. The procedure is a multi-step process that involves placing metal anchors into the bone of the jaw, allowing the anchor and bone to fuse, placing an extension in the anchor, and fixing a prosthetic tooth or crown on the extension. If you, like millions of adults, have lost one or more teeth, then you understand the unpleasant consequences that accompany tooth loss. Missing teeth result in an older appearance, difficulty eating and speaking, and other health problems like tooth decay and bone deterioration. Whether you are missing one tooth or multiple teeth, dental implants may be a viable solution for restoring your natural smile. Patients must have healthy gums and adequate bone to support the implant. The patient must also be committed to good oral hygiene, including exceptional brushing, flossing and regular visits to our Owings Mills office. Whether your tooth loss is caused by decay, years of wear and tear or serious trauma, dental implants can help you get your smile back. No other restorative procedure replaces the entire missing tooth and preserves bone like dental implants. If you're missing teeth, don't compromise your health and quality of life any longer. Visit Mendelson Family Dentistry, PA and find out if dental implants are a good fit for you.